From 2008 and 2012…… Iran no likey Barbie®. How the h*ll did we miss this ?!? Majid Qadiri: [Toys] have an evident influence on children. [It is harmful] to dress dolls in the best clothes of the best quality, in keeping with the culture that children see in cartoons and in the cinema. But if these are in keeping with our national and Islamic ideology, [our children] will not be subject to a cultural invasion. This is what the Islamic world is dealing with today. It has been invaded by foreign dolls and toys, like Barbie dolls and others, which are sold to children. These dolls should not be bought, because they have an impact on the mentality of children, and when these children reach adolescence and can choose for themselves, they will find themselves in a situation where the invading culture is dominant. Interviewer: You mentioned, for example, Barbie dolls, which are very popular in our society. How have the dolls you manufacture been received by children and parents ? Majid Qadiri: We concentrate on making Iranian dolls. It should be pointed out that it is forbidden to bring Barbie dolls into this country. We don’t want to import other dolls to Iran either. If you find these dolls in Iranian markets, they must have been smuggled in. We want to create an environment that is appropriate for children, in which they can benefit from playing with dolls with value in the cultural sense. This can give a boost to culture among children, who will not be influenced by the imported culture. On this subject, there can be only one form of commentary offered. Major thanks to long-time friend of Israel Survival Updates, ‘NatureIco‘ for the heads-up on Iran vis-a-vis Barbie©. Barbie® is a registered trademark of The Mattel Corporation. Aqua, ‘I’m A Barbie Girl’ ©1997 Universal Music Group, Denmark. Parody video ©2011 by LSFATV – They’re students at Lincoln High School, Buenos Aires, Argentina. This entry was posted on Sunday, June 14th, 2015 at 09:45 and is filed under Islam Is Evil, Main Postings, You Can't Fix Stupid..	You can follow any responses to this entry through the RSS 2.0 feed. You can skip to the end and leave a response. Pinging is currently not allowed. 6 Responses to From 2008 and 2012…… Iran no likey Barbie®. 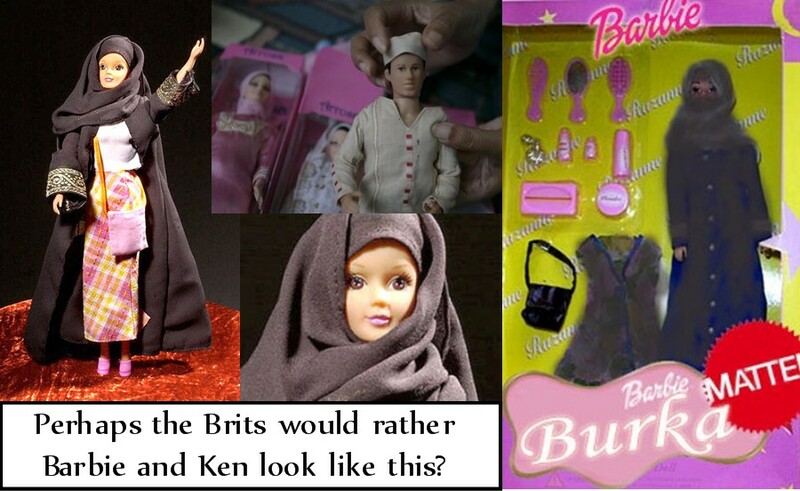 It’s getting ridiculous now Kenny, when Islam is banning even Barbie Dolls. Shhh don’t tell the Islamists about the Ken doll, or they will be beheading him or tossing him off high buildings. What about an El Guapo Doll ? Now that would go down a treat with them. Typical peace lovers in many countries have hung / burned numerous effing-gies of His Royal Treasonous Heinieness President For Life Barack Hussein Obama (PBUH)…… Free speech and all that stuff. Iranians will know true “destructive impacts” when they get some missiles lobbed at them by Israel.